Emily Legge, owner of Click Click Bang, in front of one of the locations for the photoshoot in Pleasure Point on June 26, 2017. A local salon owner is bringing the Pleasure Point community together in a creative and artistic way. Pleasure Point is the small but ever-growing home to a variety of shops and restaurants that are enjoyed by visitors and locals regularly. Emily Legge, owner of Click Click Bang salon, and hair stylist for 26 years, organized a photoshoot showcasing local products. However, Legge said collaboration wasn’t always easy. Legge said she tried for four years to collaborate with local businesses to create an artistic project that reflects all the elements Pleasure Point has to offer. Finally, she found several businesses willing to help with her vision. “When I first opened four years ago I started the business doing First Friday’s art shows and no one wanted to be apart of it except for one person…now four years later everyone I have called was super positive and wanted to be a part of something and work together,” said Legge. The veteran stylist said she was thankful and excited about the positive reactions she was receiving so far. “It’s refreshing… not everyone is willing to put themselves out there unless they are getting something back,” said Legge. 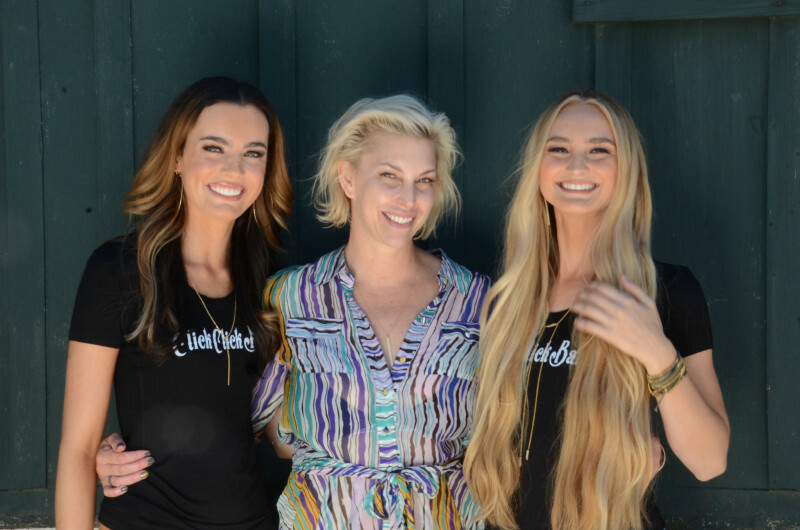 Emily Legge, owner of Click Click Bang with models (left) Julia Locatelli and (right) Kelsey Jackson on June 26, 2017 behind Freeline Surf Shop in Pleasure Point. Legge incorporated hairstyles by her salon, swimwear by Xandra Swim, old school surfboards from Freeline, skateboards from Santa Cruz Boardroom, spray tans from Pink Salt Spa, bikes from the Family Cycling Center, and jewelry from local Myla James in her photoshoot. “I just wanted to get some local businesses to work together, this is a collection of work for everyone…I wanted to show people we are professional and like to have fun and come up with cool works of art,” said Legge. Legge said she is trying to bring positive experiences to people who are working hard to be here. She has always been passionate about being apart of her community and stresses that her young stylists are too. “This is not just a job it is a career, It has been a long road and I feel like I have finally arrived and I am ready to give back to my industry, and I want to work with people who feel the same way,” Legge said. Click Click Bang features a mentor program which focuses on teaching young stylists to connect with their clients and give them a great experience as well as give back to the community. The salon is also a gallery which has rotating local artists. Freeline, which has been a staple of the Santa Cruz surf scene for decades, provided the models with old school surfboards to pose with. “We are all so neighborly around here we like to help each other out any way we can, the main thing is to keep a family,” said Brittney Barrios of Freeline. 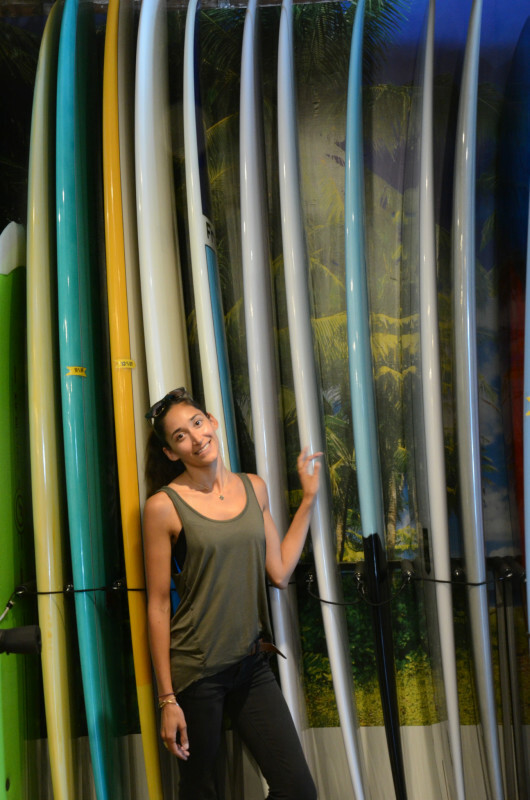 Brittney Barrios at Freeline surf shop in Pleasure Point on June 28, 2017. Founders John and Kim Mel first opened Freeline in 1969 where they designed and sold surfboards. As their business grew they moved to several different locations before settling into their current spot on 41st Ave in 1993. Xandy Dale owner of Xandra Swimwear in Capitola provided the models with swimsuits. Dale knew she wanted to be a part of the project after Emily Legge contacted her. “It’s fun to build a community and get all the local businesses supporting eachother…if we work together we can guide customers to the right place and knowing who specializes in what in our small community is important,” said Dale. 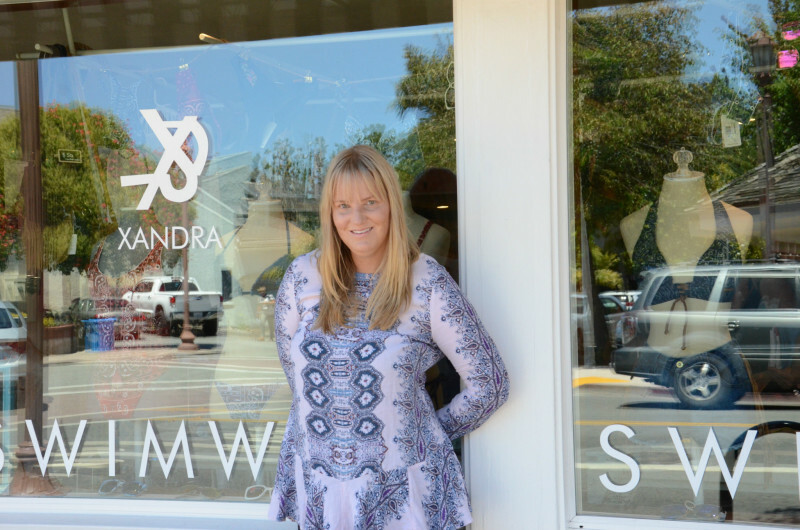 Xandra opened her business in Capitola Village in 2014 and specializes in designer swimwear and beachwear. Local photographer Terry Way was happy to collaborate with Emily Legge for this project. Way is Santa Cruz based and loves to shoot art, events, and portraits. “Emily and I are longtime friends… My experience as a commercial and editorial photographer was a perfect fit for this fun shoot,” said Way. Way has been working with Legge on and off for 20 years, and explained that this collaboration was beneficial on many levels. Xandy Dale, owner of Xandra Swimwear, outside of her shop in Capitola Village on June 27, 2017. “Emily opened Click Click Bang on Lower 41st Ave. because she saw the potential available to attract both locals and visitors to this changing and evolving Pleasure Point zone. She feels that businesses in the area will have far greater success if they can work together,” Way said. Legge is currently working on other exciting local collaborations and wants to continue to expand in the local fashion, art, and music community. She hopes to get the photos from this project published in print and in the meantime, they will be posted online, on social media, and displayed in her salon. This entry was posted in Art, Fashion Slice, Local Loop, Spotlight. Bookmark the permalink.